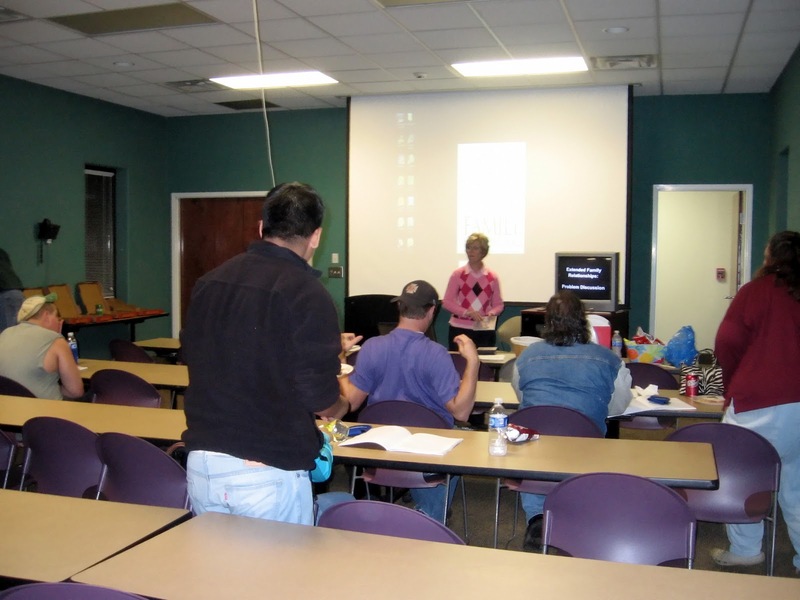 Back in December I taught a class called Marriage 911 for individuals and couples that were really in trouble. I follow a curriculum that has been developed by Joe and Michelle Williams from Modesto, CA. Their website is http://www.reconcilinggodsway.com/ and their information is so helpful for couples in crisis. One of the areas that we neglect so many times or we let it get out of control is our friendships. They can go both ways and be a problem. I have couples that one will spend too much time with their friends and neglect the spouse or there may be an isolation from friends. An individual may get too involved with work, kids or house etc… and they neglect the friendship portion of their needs. and just a time to talk with guys. I always saw this as a positive, he needed that guy time. I started praying that I would be able to have the same thing happen with some girls. I had become isolated with all my kids stuff that I was doing and friends had to be put on the back burner. God was so good and got me doing a STRANGE thing. My BFF challenged me to do a sprint triathalon with her when we turned 50. Our kids were all out of the house and I needed something to spur me into getting some exercise. So I said yes. I started training in January and went every AM at 5:30 to run swim or spin. Through that I met a friend and we started running outside. She and I then started doing the spin class and we met other friends. Eventually we started running outside together and we met some more friends. Then from there it’s been history. We have a group that has met every morning at 5:30 to exercise then go to Panera Bread to get coffee. I guess since we have suffered together for so long we have just become so close. It’s been a great group to hang with, we have gotten pretty well known in the community. I guess kinda like the Golden Girls or something. But we talk about everything and just enjoy each other’s company. Well, that Tri brought me into biking and I started with just my husband going with me and he got real enthusiastic about it and history was made again. 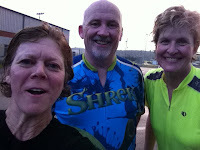 It started off with my precious friend Karen who encouraged me and kept me going in group rides. We started doing a ride at the north part of the county and I gotta have rewards when I exercise and more times than not it’s food. Karen suggested let’s go get a milkshake after we finished our ride. That soon became our ritual that summer on Tuesday nights. 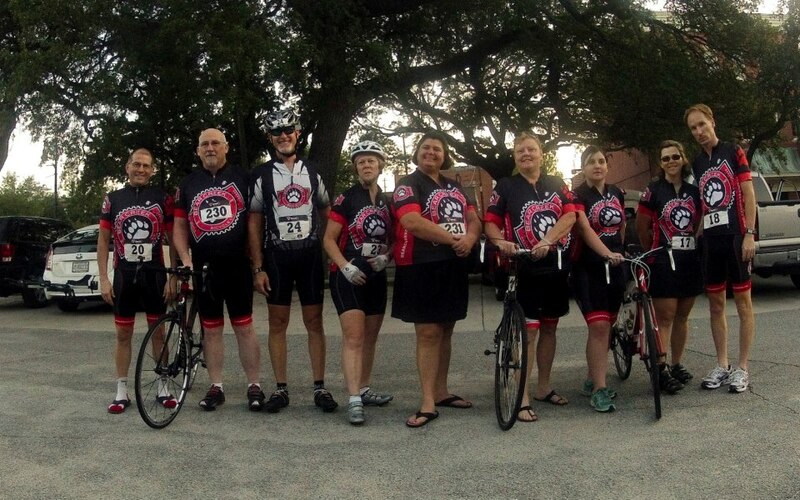 It started with her and me and we added our friend Sandy and then the word got out about how much fun we were having at the Burger Den and this year we had way over 100 join us for the Milkshake Ride. But these friends have become some of the dearest friends. I have one friend that claimed she was my frog in the pocket and joined me for my 5 at 55 year when I did two tri’s, 2 metrics and a century. She was awesome. Suffered every mile with me and we bonded forever. because of my friends. We don’t get together and husband bash we lift our families up!! We talk about ideas and goals not people and it’s so refreshing. That makes us grow and become better partners. We have experiences to share with our spouses and we are not totally dependent on our spouses. But I am blessed that my spouse encourages it. He has also developed some very close friends through this process. Who would have ever guessed seven years ago when I said yes to a goal I would gain so much more. I hope you will look at how you can develop yourself into a better person by being with other people that share common goals. Share the challenges, sufferings and celebrations. We are meant to have relationships. They are all important for us to be the very best we can be.